Friday night football has long been a tradition in Tift County. And a big part of that history for more than 40 years has made his way to the press box at Brodie Field each fall Friday night. 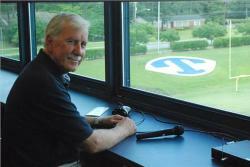 Jim Clayton, the voice of the Blue Devils for as long as many of us can remember, has decided to retire from his post and pass the job onto Jim Torell. This Friday night, Tift County will recognize Clayton for his service during halftime of the home football game. “Mr. Jim has been a crucial part of our program for so long,” said Rusty Smith, Tift County Schools Athletic Director. “We hate knowing we won’t be hearing his voice over the loud speaker on Friday nights, but we also know he’s earned a break to just enjoy the sport.” Clayton has been there through coaching changes, field changes and rule changes and has announced many pairs of fathers and sons through his four decades. After a long and successful run with JJ’s, Clayton returned to the classroom to teach math at Matt Wilson School and he served for several years as the tennis coach at Tift County High. He still works with the school system as the Energy Educator. The Blue Devils will kick-off Friday night against Westover at 8 p.m. at Brodie Field.